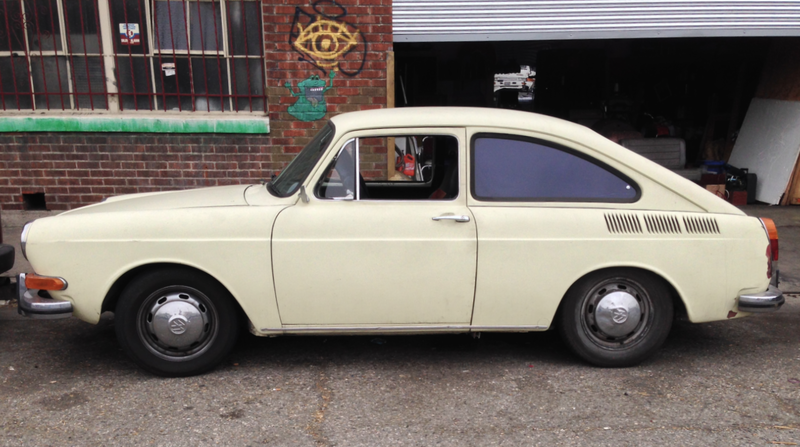 The fact is that the bloom was off the Bug (official model designation: Type 1) in Europe by the dawn of the 1960s. In the old world, the original design recalled post-war deprivation and consumers were looking for something commodious, more stylish, something more American looking even as Americans’ fervor for the beloved deutscher flivver continued unabated. 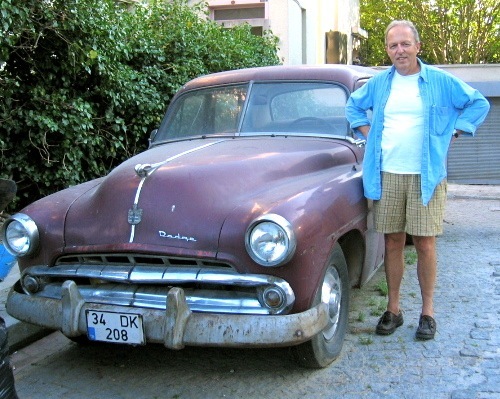 This was around the time that tail fins sprouted from Mercedes Benzes and Opels sported panoramic windshields. Volkswagen’s response was to keep its long-ago amortized Type 1 in production as well as the Microbus (Type 2) while introducing the Type 3 at the end of 1961. In terms of styling, the car was a huge departure. 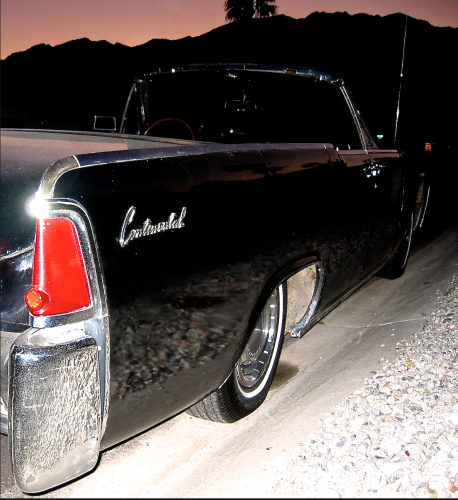 Its design was quite conventional, especially on the “Notchback” model which had a distinct hood and trunk like “normal” cars. Below the surface, however, the Type 3 was pretty much an adaptation of Type 1 engineering with a horizontally opposed (“boxer”) 4-cylinder air-cooled motor in the rear, (totally) tubular “backbone” chassis, etc. It may not have looked like a Volkswagen but it drove and sounded like one. The Notchback was never officially imported into the United States but its Squareback (station wagon) and Fastback variants made it over, beginning in 1966 offering Volkswagen stalwarts a way to “step up” without leaving the V-dub fold. The Type 3 did fairly well until Japanese imports started their own onslaught. 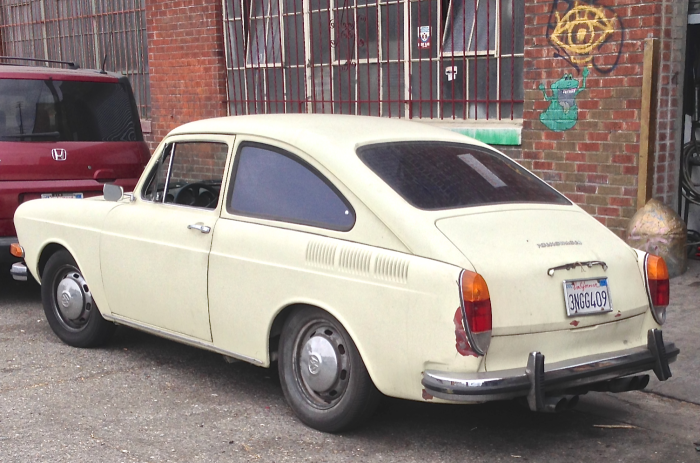 Ultimately, this led VW to bite the bullet and begin building cars with water-cooled motors and, horror of horrors, those engines were mounted in the front! While VW produced 21,529,464 Beetles* (those Germans are great record keepers, aren’t they? ), production of Type 3 was a comparatively small at 2,542,382 units. 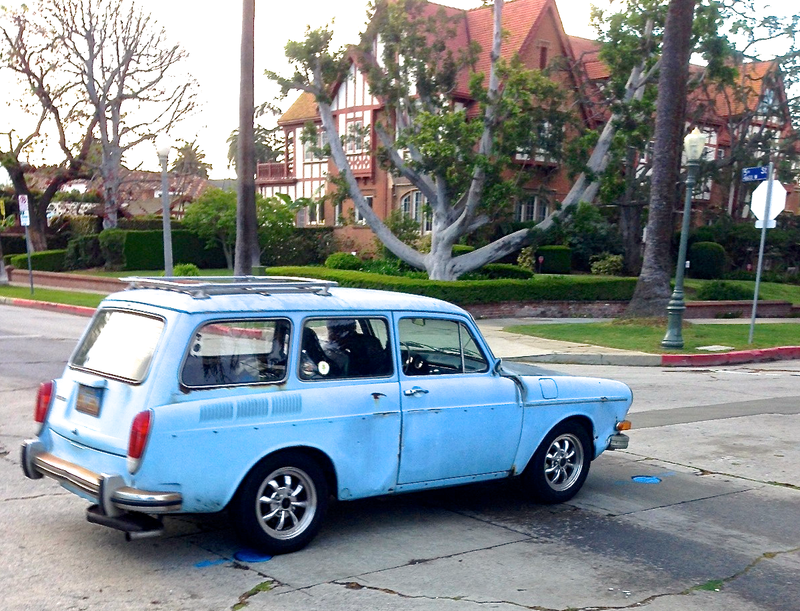 As a result sightings of Squarebacks and Fastbacks these days are much less commonplace that Beetle infestations. We’re happy to have encountered the ones seen here going about their business, disguised a normal. 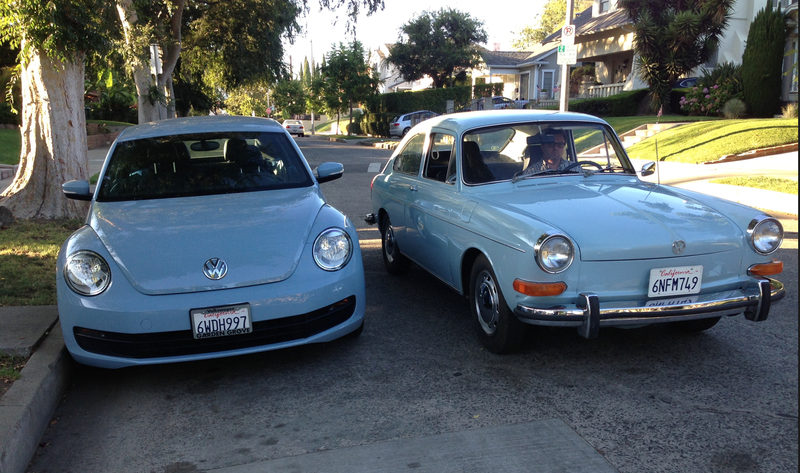 *Not including contemporary Beetles such as the one above that’s keeping company with our Fastback. Those are, in essence, re-bodied Golfs. A very young and limber Dustin Hoffman clues viewers into the fact that the Fastback had two trunks in this very clever commercial from 1967. 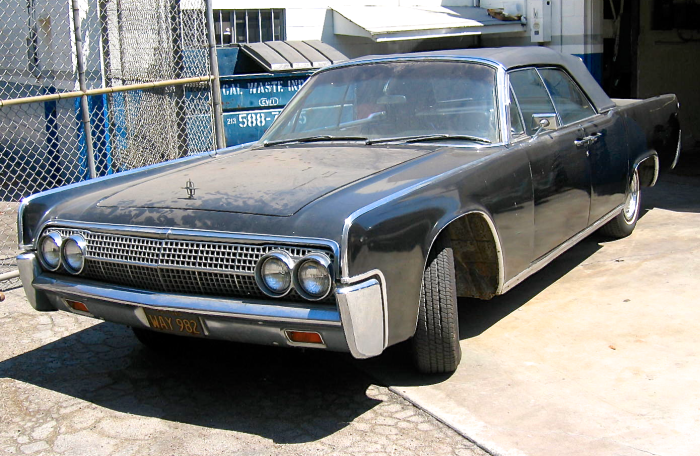 While Notchbacks weren’t officially imported to the United States a few did find their way across the Atlantic like this ’64 that’s for sale in nearby Ione, CA for a mere $17,500. We’ve long been intrigued by the Beetles bigger brother and suggest you read this Automobile Magazine Collectible Classic piece on the Squareback that dates back to February, 2008. 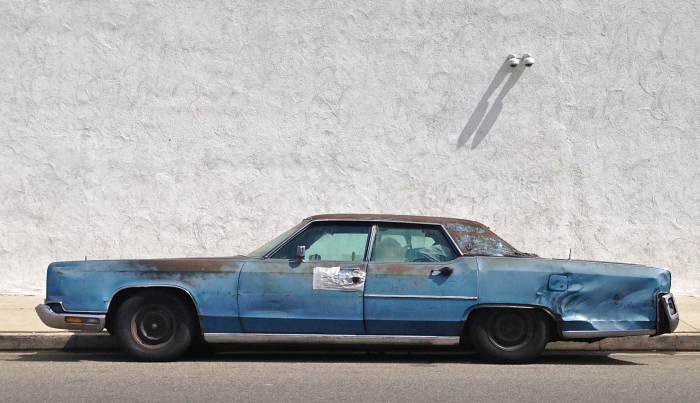 If you’ve stalked a feral car and would like to submit a photo of it for posting consideration please send it to us: info (at) feralcars (dot)com OR through our Facebook page. 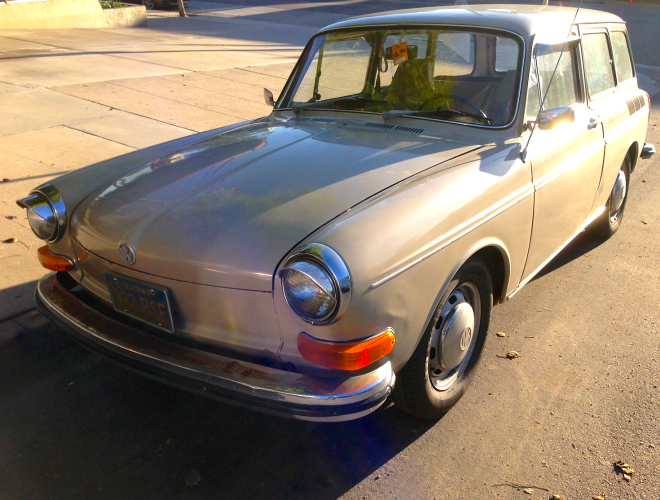 This entry was posted in Uncategorized, Volkswagen, Volkswagen Fastback, Volkswagen Squareback on 04/23/2015 by feralcars. Around dusk the other evening we were fortunate to encounter a truly nifty looking ’63 Corvair convertible at speed heading towards the heart of LA’s too groovy Korea Town. K-Town is where kimchi connoisseurs congregate, the soundtrack is K-pop and Roy Choi sets the culinary agenda so you know this is one hip car. 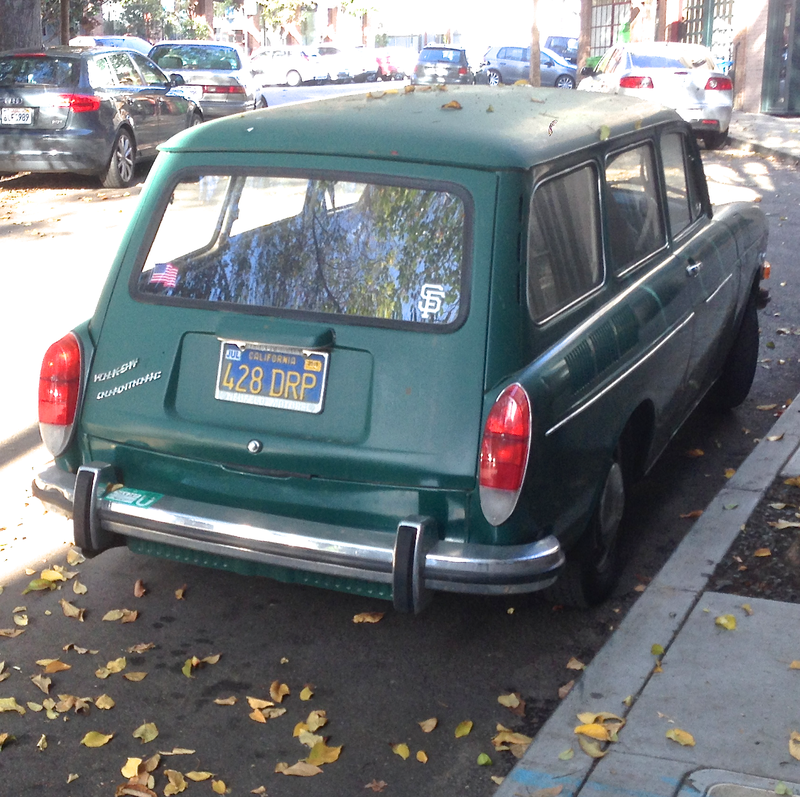 The cool driver of this first generation top-drop ‘Vair was clearly delighted to be behind the wheel. The picture perfect bane of Ralph Nader’s existence (and Al Gore’s) is finished in Ember Red and sports full wheel covers. 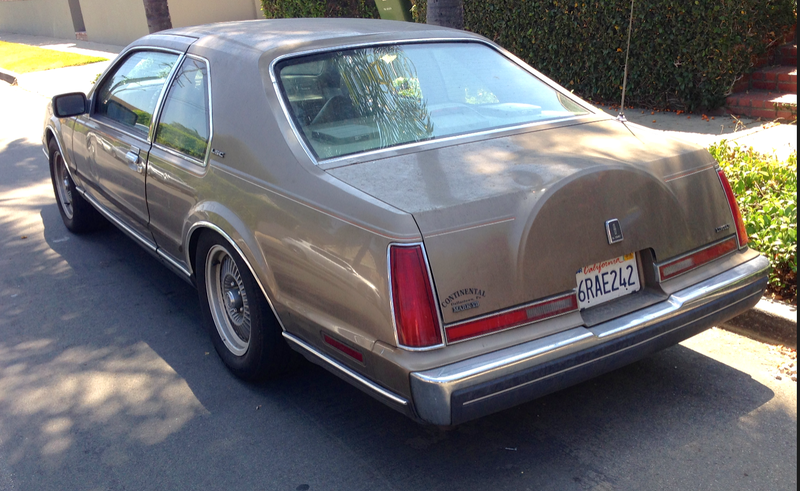 Like the bulk of Corvairs (80%) sold that year, it’s a sporty Monza model. Chevy stylists emphasized and embraced the horizontal, reflecting the “populuxe” design aesthetic of the mid century in a measured, restrained way. More than fifty years later we think the design has aged exceedingly well. While this one is not a top-of-the line turbocharged Spyder, it showed that it still has plenty of “get,” rocketing out of sight after pleasantries were exchanged. Everything about the little roadster speaks of optimism, the jaunty runabout spawned during America’s shining, yet painfully brief, Camelot era. Everything came crashing down after JFK’s death and the Corvair was thrown to the dogs, primarily as the result of a conservative public more comfortable with less radical, more traditional, compact offerings from Ford (Falcon, Comet), Chrysler (Valiant, Dart) and American Motors (Rambler American). Even GM hedged its bet and fielded the very uncontroversial Chevy II and let the Buick, Pontiac and Oldsmobile divisions get into the compact car fray. Only Corvair was powered by an air cooled aluminum, horizontally opposed motor coupled to a transaxle with four wheel independent suspension and unit body construction. 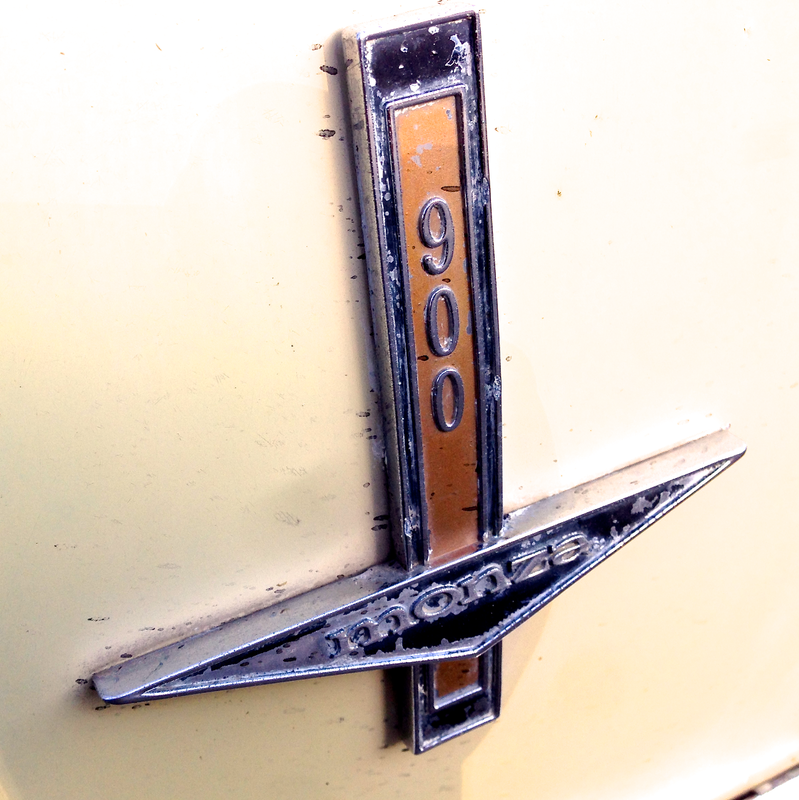 Corvair had more in common with Porsche, Volkswagen, Tatra and even Tucker than it did with an Impala or Bel Air. It was “too hip for the room,” in many respects. 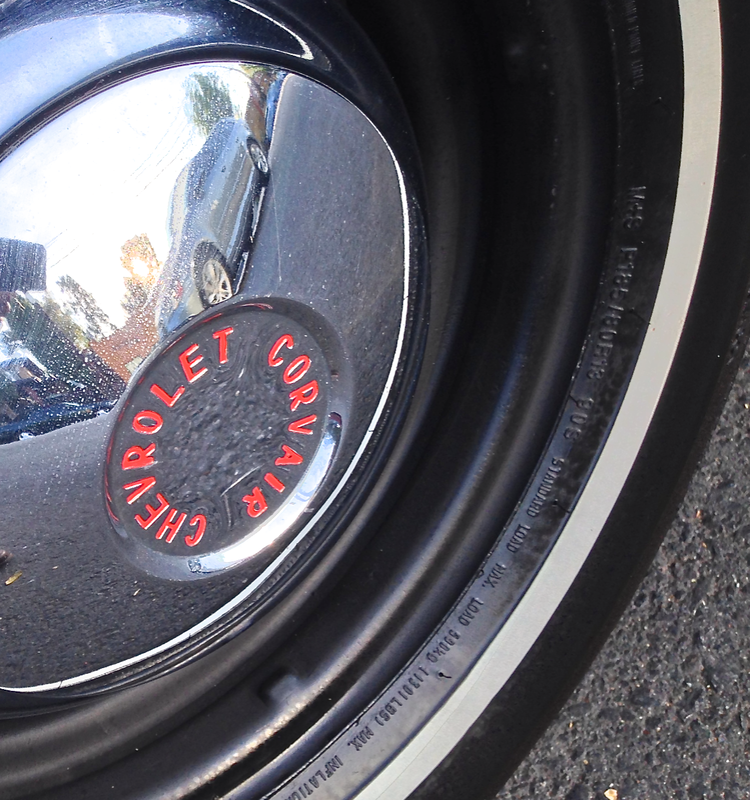 We dig the “dog dish” hubcaps on this less than pristine ’63, finished in Adobe Beige. The crossed flags on the rear deck lid indicates it’s powered by a 2.3 liter motor which sounds a lot smaller when expressed as 145 cubic inches. That little pepper grinder developed just north of 100 horsepower but the car only weighed 2600 pounds so it’s comparatively quick. It was extremely maneuverable, perhaps to a fault as Ralph Nader reminded. One person’s definition of nimble is, perhaps, another person’s definition of deathtrap. Nimble Deathtrap = great band name! 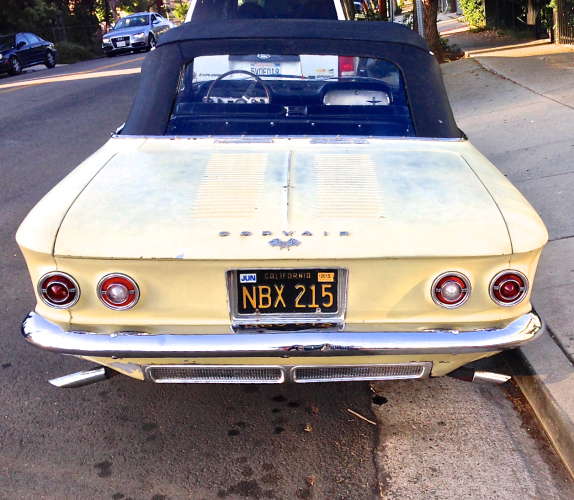 To some extent Corvair got a bum rap. It was only dangerous if you didn’t know how to skillfully drive it to get the most out of its, shall we say, idiosyncrasies. Fun for some but perilous for others. Corvair is gone but hardly forgotten. 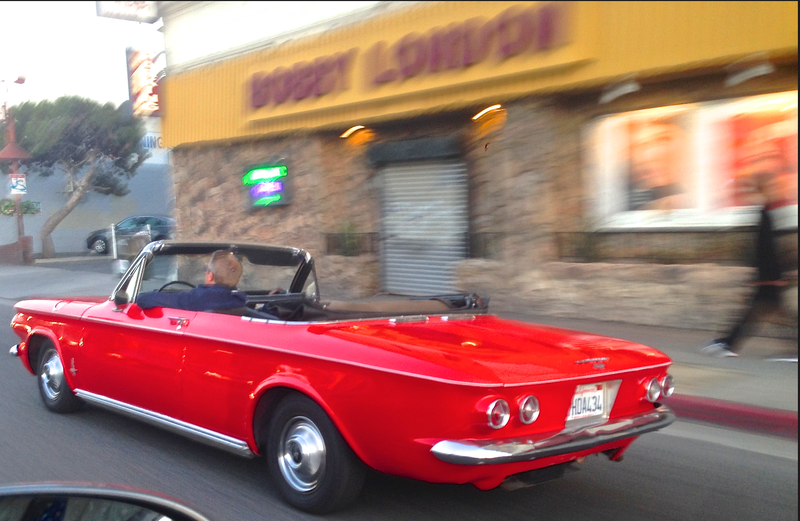 Corvair people are a loyal lot and one of the biggest owners groups, among all vintage car clubs, is CORSA — Corvair Owners Society of America. Why not join them by acquiring one of your own? We kind of love this 4-speed ’64 teal convertible in nearby Springfield, OH, offered at just under $18K. It’s half the price of what you’d pay for a Porsche but almost all the fun plus it has an actual back seat! Don’t let this one pass you by! Michael Landon, Bonanza’s “Little Joe Cartwright,” hosts this punchy commercial for the high performance Monza Spyder. Did we mention that Chevy was Bonanza’s sponsor? 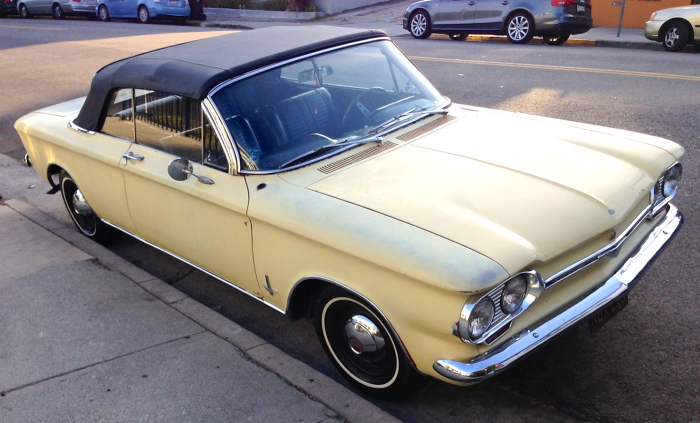 This entry was posted in Chevrolet, Corvair on 04/17/2015 by feralcars. All of which gives us an excuse to look at some older (Lincoln, not Bentley) Continentals caught in the wild and to rev up the old Victrola to hear Fred Astaire croon, “It’s quite the fashion, The Continental. Do we have to spell it out for you? 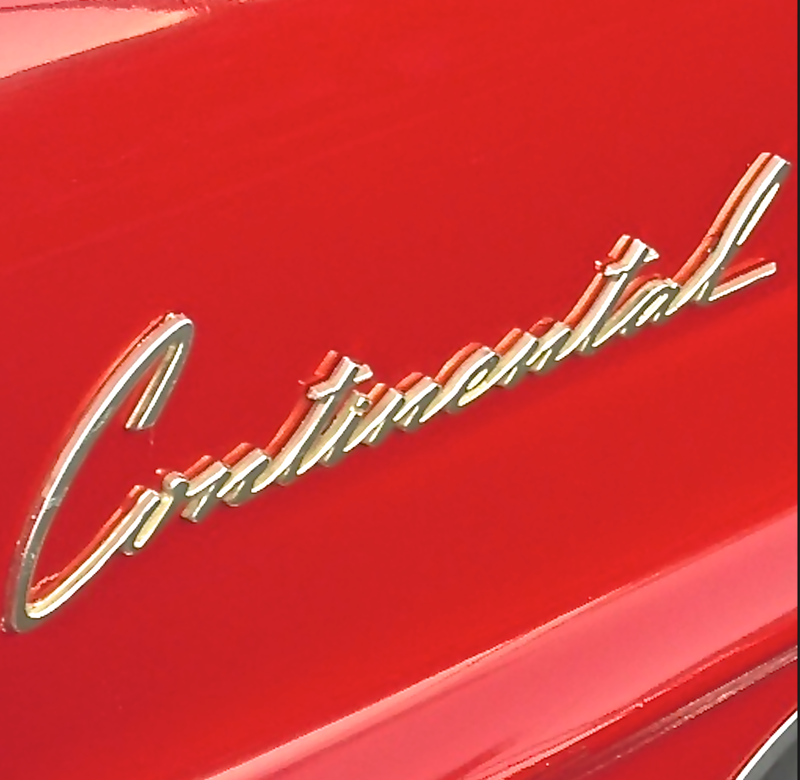 Over the years, starting in 1939 and continuing with some interruptions until 2002, the Continental nameplate has been affixed to both sedans and convertibles as well as two door coupés , the later usually sporting the “Mark” designation (as in Mark II, Mark III and so on). 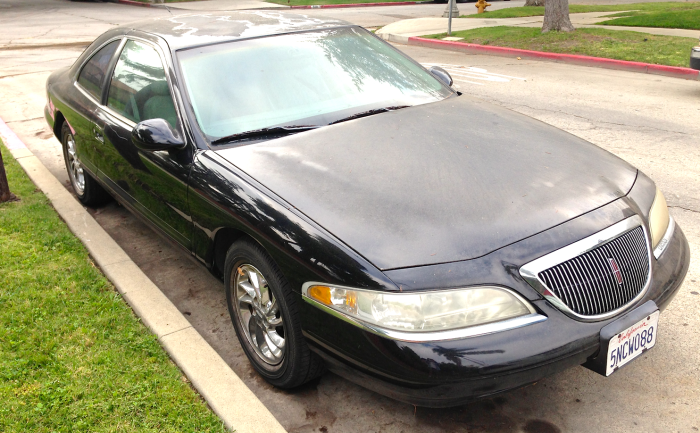 The very last “Mark” was Mark VIII but, truth be told, Ford repeated Marks III, IV and V as part of a “do over” program that began with the introduction of the Mark III in 1968, as opposed to the 1958 Mark III. We know what you’re thinking so go ahead and breathe a sigh of relief because there definitely won’t be a midterm. 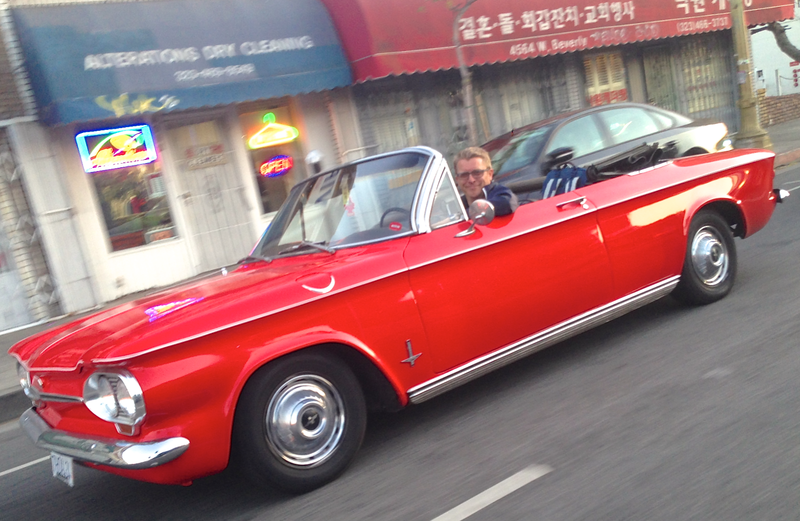 Feral Cars Field Scout Matthew Reader found this ’57 Mark II posing glamorously the other day. 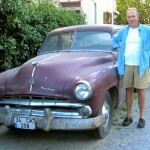 Despite the fact that when new it cost more than a Rolls, Ford lost money on every one sold. The cost of prestige can be steep and unprofitable. Still, we think it’s on of the most distinguished designs of the ’50s and flies in the face of be-finned, chrome dripping, excess that typified the era. Did somebody just say “excess”? Here you go: it’s a 1960 Mark V convertible loitering by the side of the road. This behemoth weighed almost 5200 lbs, measured 19 feet from step to stern and could be counted on to get a solid 8 – 10 miles per gallon. We kinda love it. 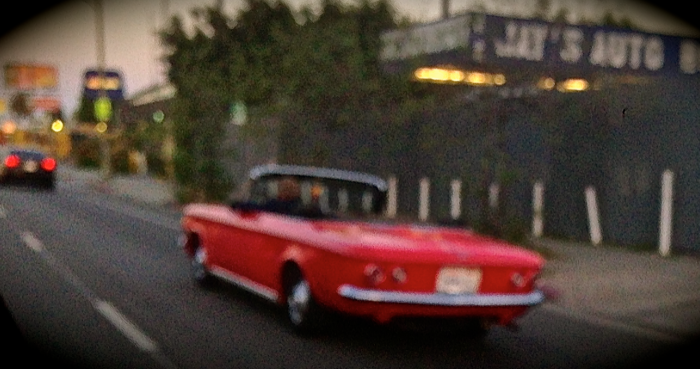 We caught another Mark V, this one a four door hardtop, in motion. Dig those “Dagmar” bumper bullets and the “breezway” rear window, a feature that sister brand Mercury featured over the years. It’s a great way to let fumes into the car to lull the rear seat passengers to the land of nod. 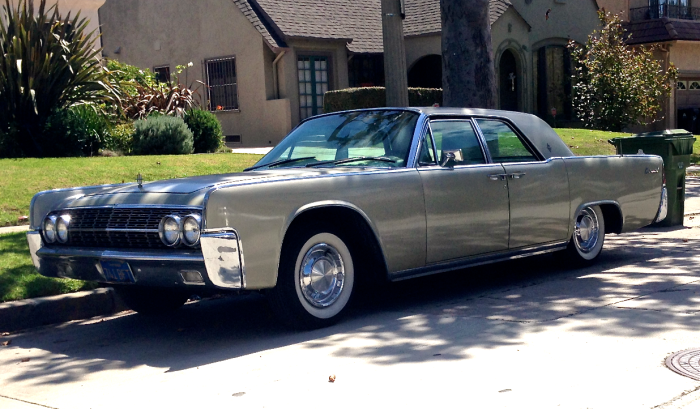 Speaking of huge, here’s a ’79 Continental Town Car that has its predecessor beat in the length department by another half foot. Those oval portholes, the half padded roof treatment and the B-pillar opera lights and fender skirts presaged the whole “Dynasty” look by a good two years. We don’t have much to say about the somewhat older one seen below except that it may very well have been hit by a meteorite and seem none the worse for wear. Certainly, nothing that a little duct tape couldn’t handle. 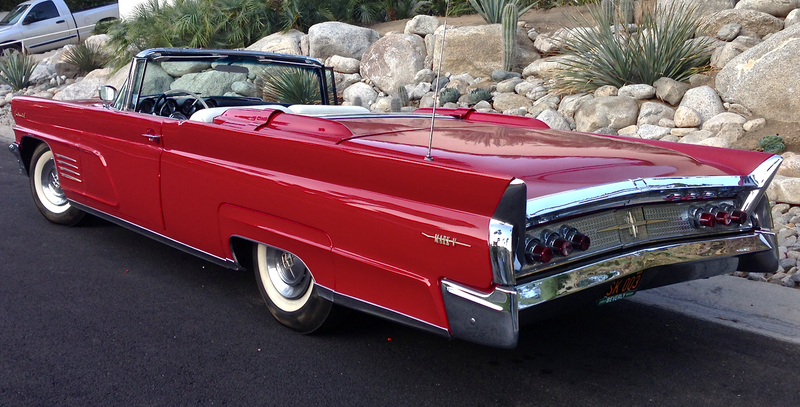 Say “Lincoln Continental” and chances are someone will respond with “suicide doors” or “JFK.” Here’s a dusty ’63 convertible– yes, the same model year as the one that wasn’t able to get through Dealey Plaza unscathed. Those rear-hinged doors in the back make ingress and egress a breeze and it’s kind of shame that Ford The Lincoln Motor Company didn’t see fit to equip the new Continental with this signature feature since that’s what, inevitably, springs to mind and Bentley doesn’t have them. 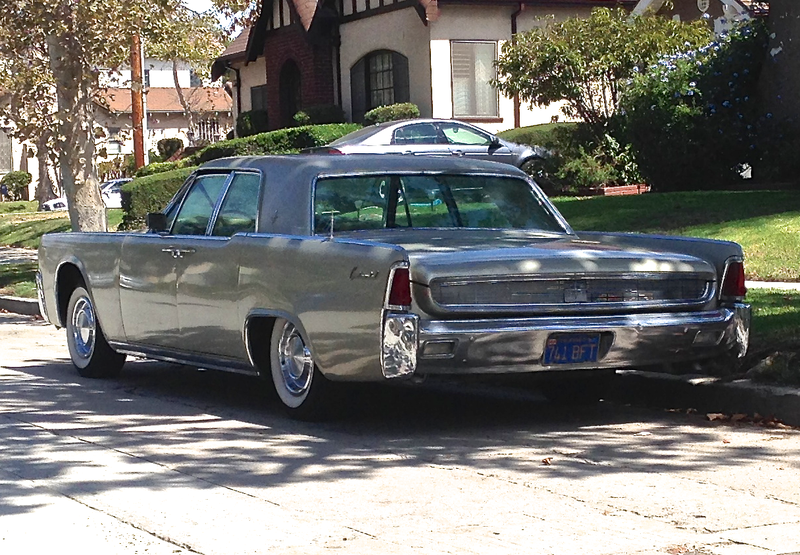 If you were a Mafia don in ’62 this is what you’d drive — so much trunk room! 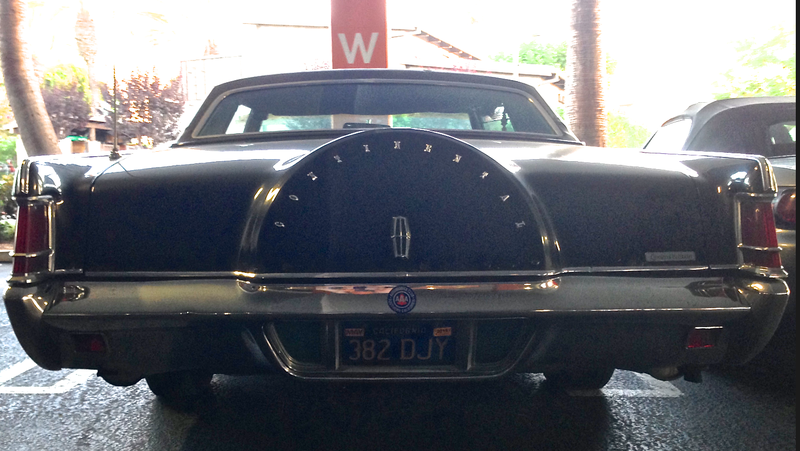 This ’62 Continental sedan says “New Frontier” in no uncertain terms and we applaud the fact that vinyl roofs hadn’t yet been foisted upon us. This is the car we wish the new Continental recalled but that doesn’t seem to be in the cards. Pity. We think the Continental Mark III a/k/a “The French Connection Car” presents better in black but it’s unfortunate that this one seem to have its “eyes” stuck open. 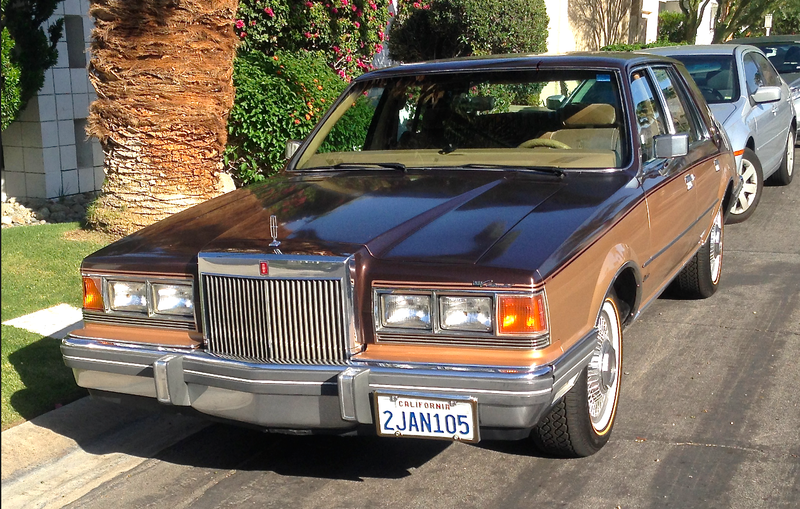 The Mark V was produced from 1977 to the 1979 and was is the biggest of all “Marks” and the best seller: an average of 75,000 of these big boys were sold in each model year. This example also sports that wide-eyed look. 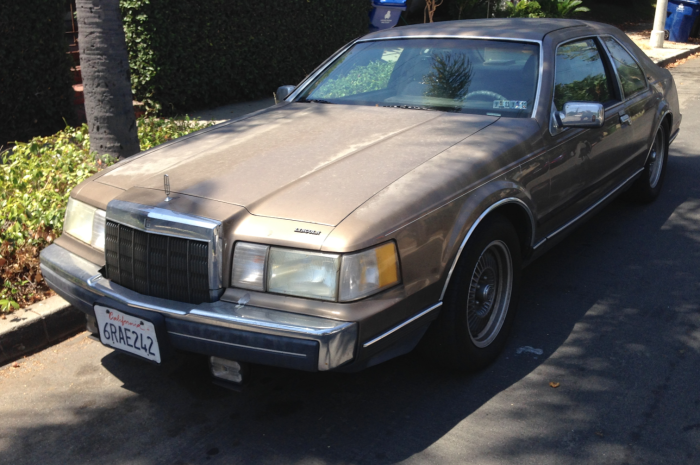 By ’82 Continental was back as a sedan but significantly downsized from the aircraft carrier class of which it had been part. 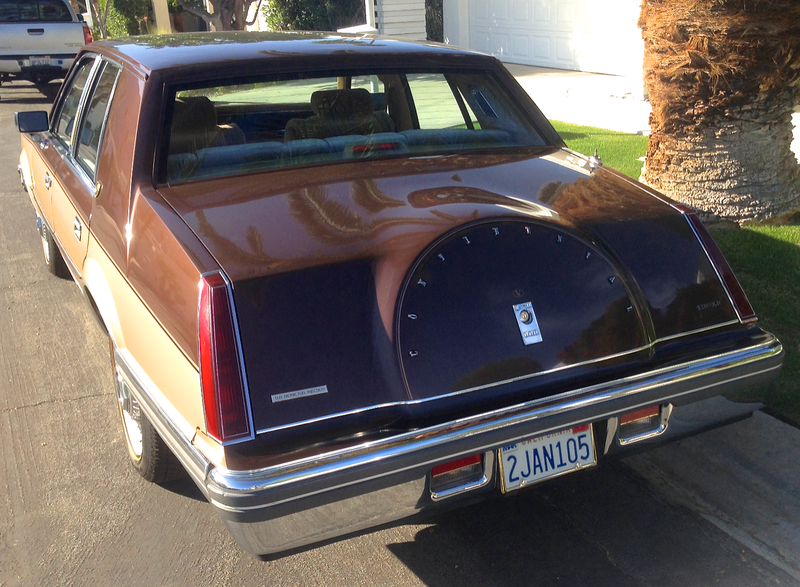 The truth was that underneath that “eleganza” exterior with “bustle back” styling, was the platform upon which the lowly Ford Fairmont was built. Talk about selling the sizzle sans steak! The bustle makes a comeback! The Mark VII, introduced in 1983, shared much with Ford’s Thunderbird and Mercury’s Cougar but held its own for nine model years. This one is an LSC, the performance variant, and if you don’t look too closely it does sort of resemble BMW’s 635CSi except that BMW hasn’t, to date, ever built a car with a fake spare tire stamped into the trunk lid. Their loss. As noted, the last of the “Marks” was the Mark VIII. 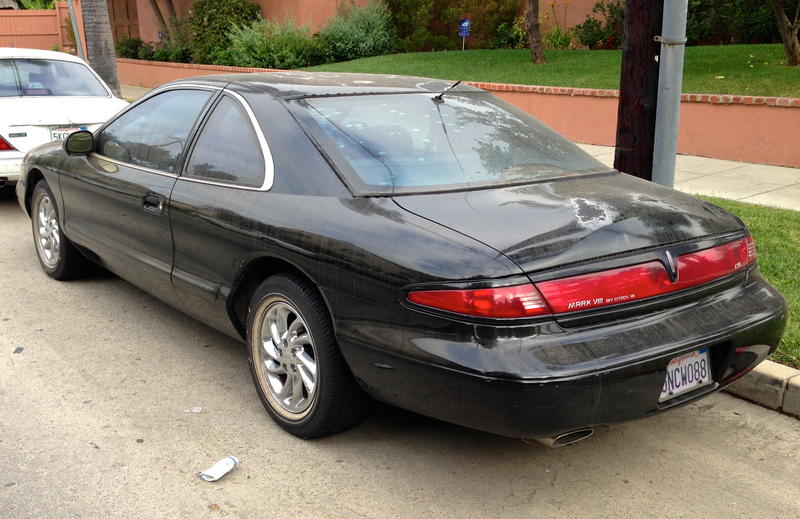 We found a ’97 LSC that seems to have some issues with its clear coat, not to mention the rear-mounted cell phone antenna. 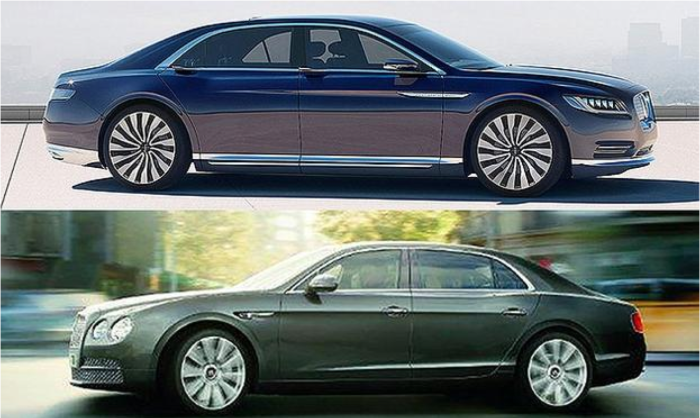 Those “salad shooter” wheels are aftermarket so don’t blame The Lincoln Motor Company for this particular lapse of taste. It’s a fact that your President Nixon gave Brezhnev a Continental when the latter visited the former at Camp David in 1972. We just love this dramatization of that wild encounter. 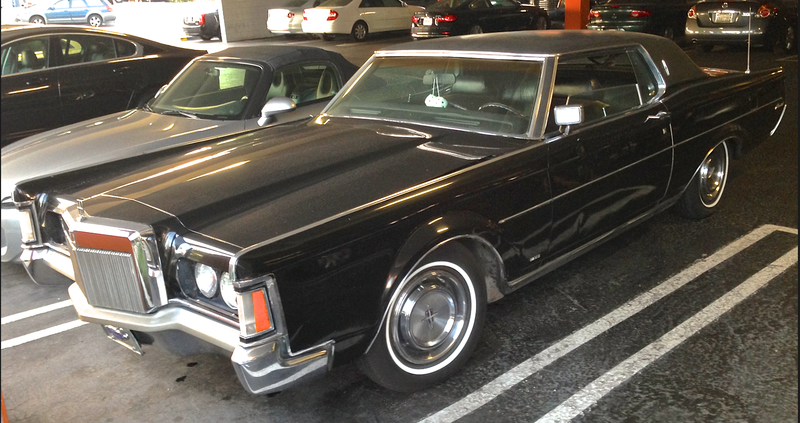 This entry was posted in Bentley, BMW, Lincoln Continental and tagged Brezhnev, Nixon on 04/07/2015 by feralcars.